Mitochondria are tiny living things, rather like bacteria. They live inside the cells of almost all animals, plants, and fungi, where their job is to process glucose in order to provide a source of power for the rest of the cell. Without their help, we wouldn't be here. 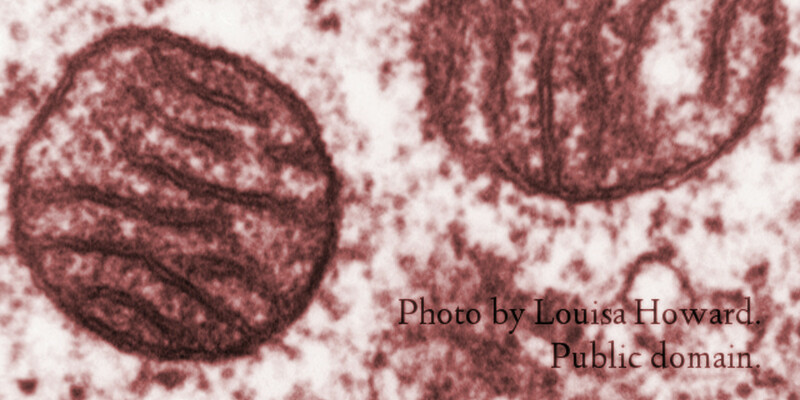 Two cheerful little mitochondria from a lung cell. Each is about 0.00025 millimetres across. Photo by Louisa Howard, public domain. What fascinates me particularly about mitochondria is that they have their own DNA, which is not at all like human DNA and much more like the DNA of bacteria. Part of our bodies is essentially a different creature. And because you inherit all your mitochondria only from your mother, mitochondrial DNA is very useful in tracing your ancestry. So how did we come to have these creatures living inside our cells? The most commonly-accepted explanation is that two billion years ago, when complex cells were just starting out, the mitochondria discovered that the cells were a good place to live inside, with lots of glucose to feed on. It was just as useful for the cell, which needed the glucose processed. Symbiosis! The mitochondria hitched a lift, and they've been with us ever since. So even when you think you're alone, remember you're also a sort of walking mitochondrial city.